I love board games, I remember playing them for many happy hours with my Dad when I was young. Just recently, Z has become able to play more involved games with us and I’ve been so surprised at how fast he has learned to play them. 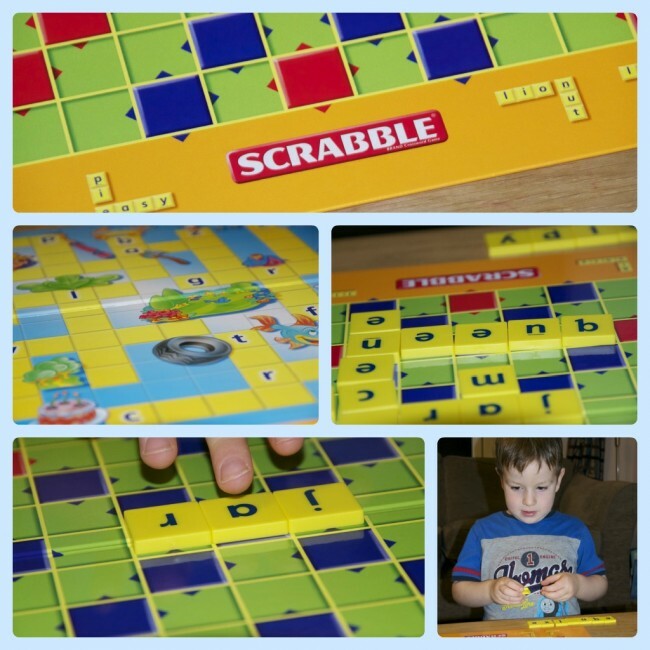 Junior Scrabble is aimed at children aged between 5 and 10. The board is reversible, level 1 has some letters already in place as well as pictures to give clues. If you complete a word you get a counter. My 5 and 4 year old have both enjoyed playing this part of the game and I think it will be great for helping them learn to form words and aid spelling. Its been brilliant to have a game which challenges them both and yet is still fun. Level 2 is a simplified version of Scrabble where you cross words and try to reach coloured squares. Z, who is 5, finds this way of playing much harder, but tries really hard to make words which fit. Again, it is great for helping with spelling and word recognition. 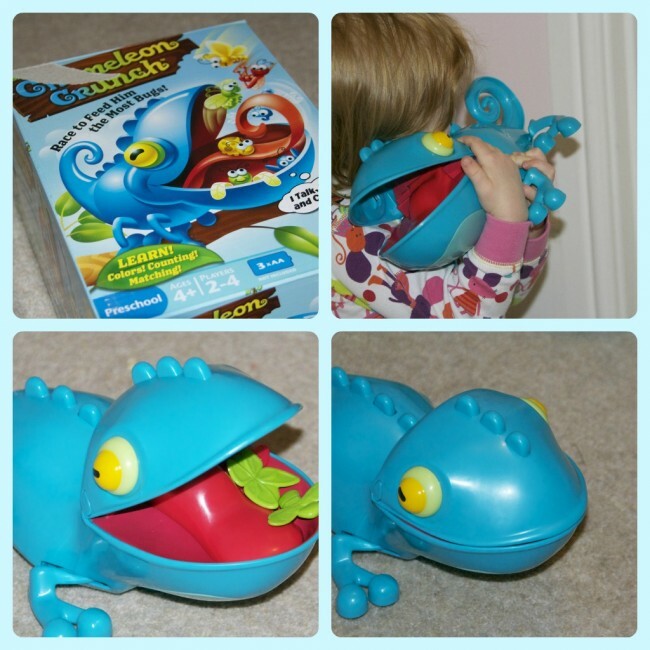 I was quite skeptical when I saw Chameleon Crunch, as I am not usually a fan of that style of game, but as soon as we turned it on all 3 children were laughing hysterically and chasing the chameleon around the house. The aim of the game is to feed the Chameleon as many bugs as possible. You can do this by each choosing a colour or a type of bug, which is great for colour recognition and matching skills. The Chameleon moves quite quickly and every now and then makes a noise and opens his mouth spitting the bugs out. It really is hilarious! Lots of fun for the whole family. UNO Roberto is my kind of game. 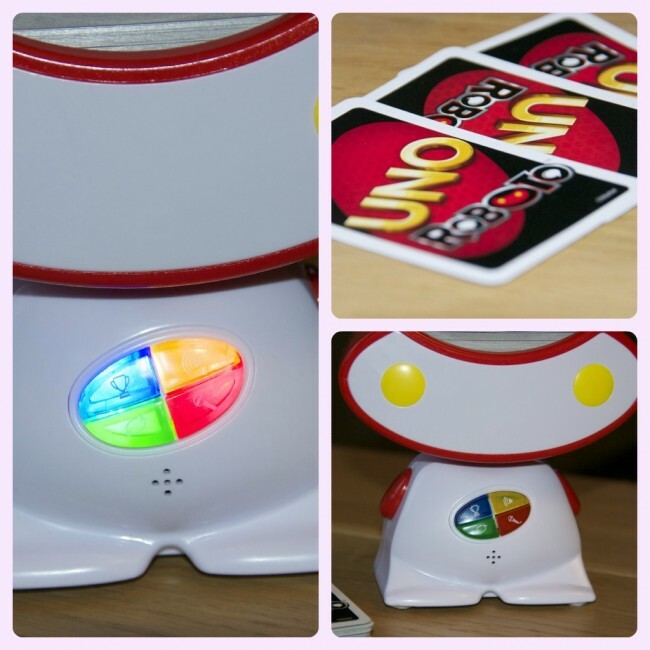 As with normal UNO the aim is to get rid of your cards, but the robot adds a funky twist. Before the game starts each player records their name and also a house rule is recorded. The first one we had was ‘take 10 cards and jump up and down’, which definitely finished the game quickly. The robot shouts out funny tasks and phrases throughout the game, making it very interactive and lots of fun. The game is aimed at children aged 7 and up, but Z managed to play easily. You can play with up to 10 players which would make it great fun at a party. I would recommend all three games, but I am a big board game fan. I love games that we can all play together, as a family. I like the sound of Chameleon Crunch!